Wireless networks can impair voice, video, and data quality by various means including poor mobile phone quality, voice compression and decompression algorithms, video compression and decompression algorithms, delay, loss or gain in speech levels, noise, acoustic and landline echo, and other distortions. GL provides a compact and portable solution for Wireless Devices, and Mobile Radio testing. Using the GL VQuad™ application with the Dual UTA HD, or all-in-one VQuad™ Probe HD, voice, video, and data QoS can be tested for practically any end-point (customer experience) interfaces. The Dual UTA HD is a compact and portable device which provides multiple interfaces for connecting to any communication device on a network. The VQuad™ with Dual UTA HD can work with variety of networks, including Wireless (Bluetooth®, Wi-fi, 3G, 4G, LTE, PTT), VoIP, Analog, and TDM. Various associated applications (Voice Quality, Video Quality, Data tests, Echo and Delay tests, Fax tests, VBA) works with VQuad™ Dual UTA HD to provide "end-to-end assessment" with additional test and measuring capabilities. Additionally, the Dual UTA HD includes support for testing HD voice using Bluetooth® Wideband, FXO Wideband, and also includes PTT interface for wireless mobile device testing. Enhanced VQuad™ with Dual UTA HD supports two methods of automated testing of mobile devices, Bluetooth and Wired Headset using GL’s new cable, Smartphone with Automated Call Control (ACC). Through the VQuad™ script (or manual operation), calls can be setup and send messages using iPhone SIRI or Android Google Voice available on mobile devices. VQuad™ includes Text-to-Speech technology for automatically creating the necessary voice prompts required to work with Siri or Google Voice. Results provide an excellent overall measure of end-to-end voice, video, data, and signal quality. All the applications work in conjunction with the VQuad™ for automatically and remotely analyzing the captured data and sending the test results to the central database. You can query results remotely or control the tests using web-based WebViewer™. Wired Headset supports NB, WB, SWB. Bluetooth® compatible. Performs RSSI, Battery level functions, Network verification. Support for Bluetooth Wideband with 16000 Sampling Rate used in VoLTE network with AMR Wideband codec (requires latest Dual UTA HD firmware and hardware). The VQuad™ with Dual UTA HD system can connect to Bluetooth mobile phones or any end-equipment supporting HD (WB) audio on all interfaces. The Bluetooth solution supports full Call Control with ability to confirm current status of call as well as sending commands to the phone, via Bluetooth, to retrieve Signal Level (RSSI), Battery Level, Current Network, to name a few. While in the established call, traffic analysis and Voice Quality is fully supported for both NB and WB networks (VoLTE fully supported). With the Dual UTA HD Bluetooth® option, the Dual UTA HD act as a Bluetooth® Headset and connects to the mobile phone to perform voice quality analysis along with accurate delay and level measurements on Bluetooth® enabled mobile devices. The Dual UTA HD can act as the Mobile Device and connect to any Bluetooth® headset to perform ‘Voice Quality Tests’ on the Bluetooth® Headsets. In other words, isolate the Bluetooth® headset for voice quality analysis. This is extremely important for testing Bluetooth® headsets, Bluetooth® in the car, and pretty much any Bluetooth® device which connects to a mobile phone for voice. Both narrowband and wideband codecs are supported. 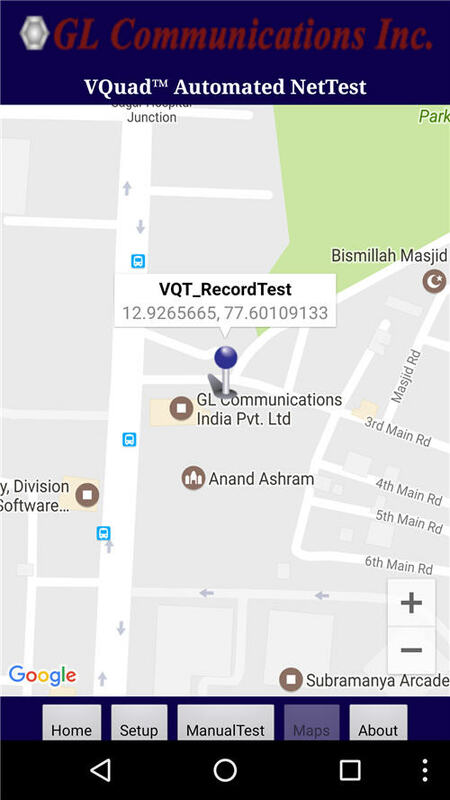 VQuad™ is enhanced to fully automate Mobile Phone Testing using Bluetooth®. Mobile devices connected to VQuad™ via Dual UTA Bluetooth interface can be controlled through the VQuad™ scripts (or manual operation). VQuad™ can activate the iPhone SIRI or Android Google Voice and send voice commands to the mobile device in order to perform different set of functions like Placing Call, Answering calls, Rejecting calls, Disconnect calls and Sending Messages (SMS). In addition, VQuad™ includes Text-to-Speech (TTS) technology for automatically creating the necessary voice prompts to perform these functions over Siri or Google Voice. By invoking Siri/Google Assistant it is also possible to setup calls over VoIP applications like Skype, WhatsApp, Viber installed on iPhone devices and using Hangout app on Android devices. It is also possible to send text messages through these applications using voice commands generated using Text-to-Speech conversion facility. Similarly, it is also possible to invoke GL applications (GLNetTest, and GLNetTestVQT) installed on the mobile devices and perform tests. The Wired headset method connects the mobile phone to the Dual UTA HD PTT interface using the GL Smartphone Automated Call Control (ACC) cable. 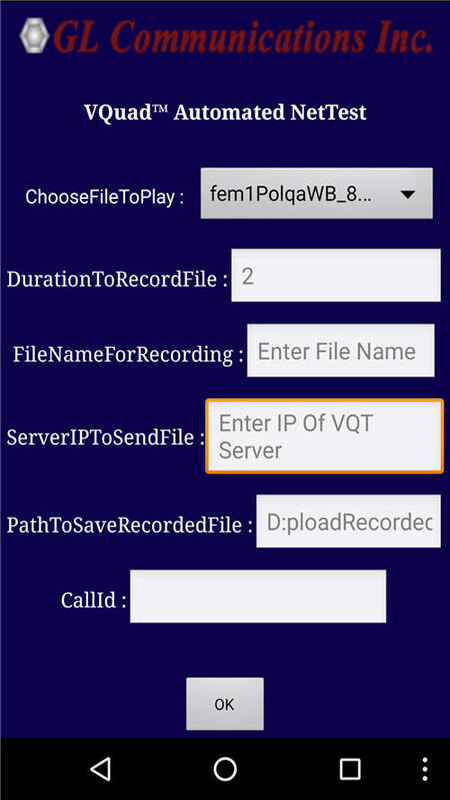 Through the VQuad™ script (or manual operation), the VQuad™ can activate the iPhone SIRI or Android Google Voice and send a predefined file to the mobile device in order to Place Call to a specified number (or simply Redial). In addition, VQuad™ includes Text-to-Speech technology for automatically creating the necessary voice prompt for placing call over Siri or Google Voice. In other words, the Smartphone ACC cable method includes a fully automated method for Placing Call, detect incoming Ring (for automated Answer call), Answer Incoming Call (or Reject Incoming Call), Disconnect Call, and messaging. 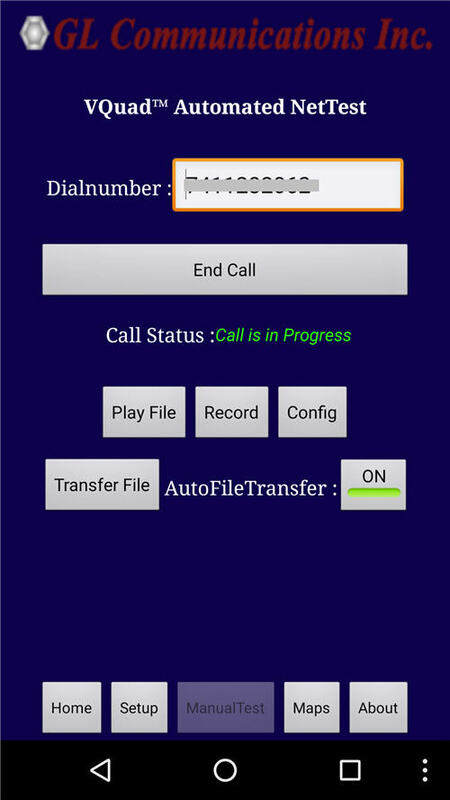 The Smartphone ACC can perform all basic Call Control functions for fully automated bi-directional call control and the method also supports NB, WB, and SWB sampling. 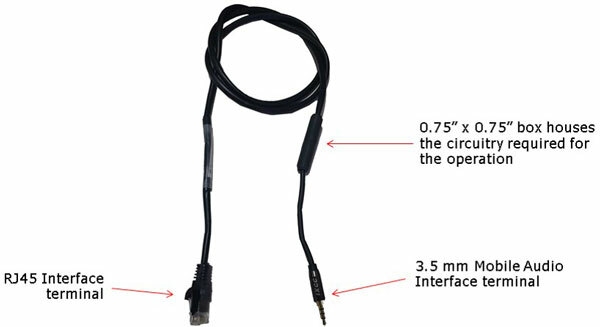 GL’s Smartphone Automated Call Control (ACC) cable is designed to connect RJ45 PPT interface of the Dual UTA HD unit to the 3.5mm jack enabled Smartphone Handset device. So, the cable has RJ45 interface at one end and 3.5mm Mobile Audio interface terminal on the other end. 0.75” x 0.75” box on the cable houses the circuitry required for the operation. GL's VQT standalone software may be executed automatically (real-time and/or post-processing) or manually by entering a Reference File and Degraded File. 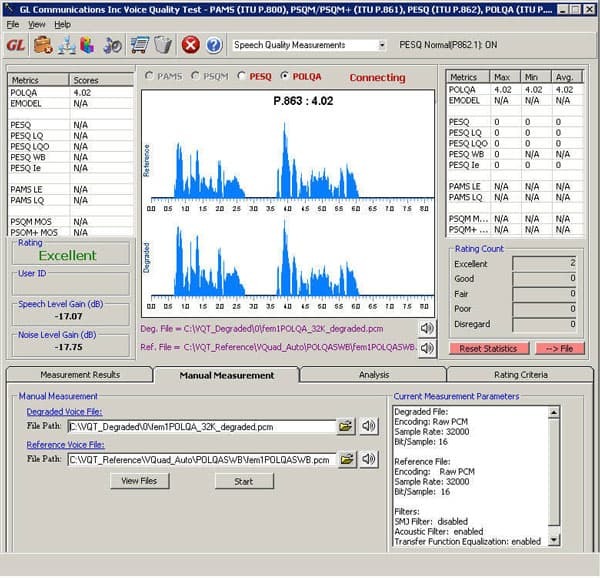 Regardless of how GL's VQT is initiated, algorithms for POLQA, PESQ MOS, and PESQ LQ are executed simultaneously for the two voice files and results are shown graphically as well as in a tabular format. 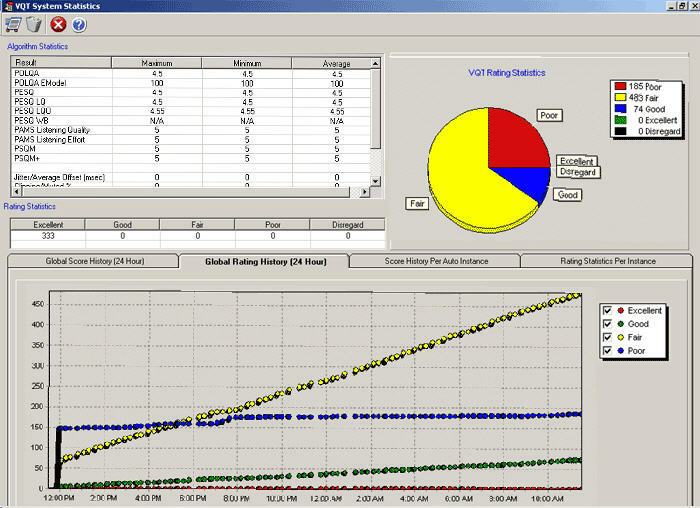 GL's VQT also displays cumulative statistics for large scale testing over long periods of time. VQT supports analysis of PCM16 files consisting raw data as well as u-law/a-law encoded data. VQT also support analysis of uncompressed wav files consisting of narrow band, wide band and super wide band signals. This system connects at the digital level (Ethernet 10/100) and at the analog level. 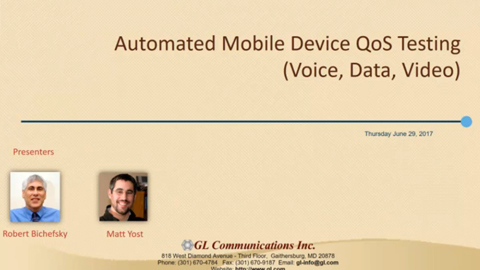 It can perform call generation and analysis of VoIP Calls and VQT measurements to/from the mobile. The Dual Universal Telephony Adapter (UTA) HD has the ability to interface to a mobile radio, thus allowing for voice quality testing. Control of the Push-to-Talk (PTT) feature is available with the Dual UTA HD and the VQuad™ software. Directly before the audio file is transmitted the VQuad™ software will command the Dual UTA HD to enable the PTT on the radio. This feature makes the testing completely automated and hands free.